This is the second article in my series on GDPR considerations for Microsoft Dynamics 365. If you are not aware or not sure in details what GDPR is and how it impacts Microsoft Dynamics 365 Solutions and Projects, then please read my first article in this series. In this article, I’m trying to cover Microsoft Dynamics 365 CRM readiness for GDPR which is due to be effective on the 18th May 2018. 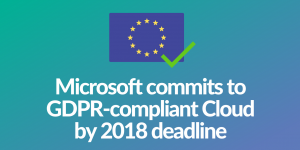 In summary, Microsoft is committed to bring all its products, services and processes to be compliant with GDPR by May 2018. Role-based security in Microsoft Dynamics 365 allows you to group together a set of privileges that limit the tasks that can be performed by a given user applied against a specific Dynamics CRM entity or specific task/action privilege. This is an important capability, especially when people change roles within an organization and directly impact data protection and security. Field-level security allows you to restrict access to specific high-impact fields, such as personally identifiable information and sensitive data such as sexuality, religion and ethnicity/race. This is significantly essential for GDPR compliance and I have personally been involved in applying these considerations to some of our ongoing Dynamics 365 projects to ensure our Dynamics 365 solution is in compliance with GDPR in advance. Similarly, all current Dynamics 365 projects and live Dynamics 365 solutions must be updated and modified to ensure compliance with GDPR using these and similar capabilities. Security Development Lifecycle: a mandatory Microsoft process that embeds security requirements into every phase of the development process. Dynamics 365 is built using the Security Development Lifecycle. Encryption: in transit between your users’ devices and Microsoft data centers, as well as while at rest in a Microsoft database. This helps protect your Dynamics 365 data at all times according to Microsoft. This restriction particularly applies to Dynamics CRM Online / Azure Cloud.